Does Student Debt Add Up to a Good Investment? The cost of tuition has been inflating by a factor of 12 since 1978 according to the Bureau of Labor Statistics. At the same time, inflation on all other goods has been increasing by a factor of 3.6. Minimum wage is trailing behind for everyone. What does this mean? The math of the situation is a hot topic of debate. Take on student debt or forego college and jump into the workforce? We’ve all been told that college is an investment in our future, but tuition inflation is rapidly eating up the potential returns. While people with bachelor’s degrees and associates degrees still tend to make significantly higher wages than people without degrees, these same people have to live in more debt for longer periods of time. People who have been to college but not completed their degrees are the worst off of anyone because they face the double-whammy of student loan debt and significantly lower wages than their classmates who completed their degrees. None of these situations are ideal. As college tuition rises and wages fall relative to inflation, people with degrees will find themselves more and more unable to justify investing time and money in a degree that affords them marginal returns. People without degrees face lower wages, and people with higher education but no degree get to pay back their college loans on a salary of someone without a degree. But there’s now a fourth option. You can get a degree without going into debt based on the classes you have already taken and your own hands-on experience in the field. 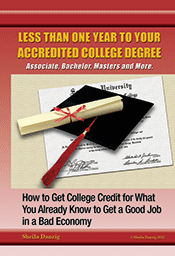 Have you taken classes but never completed a degree? Have you never enrolled in college but been in the workforce for many years? You can utilize the valuable education and practical experience you already have to get the degree you deserve without even enrolling or taking another class. Find out how. Visit us online at thecareerpeople.com.